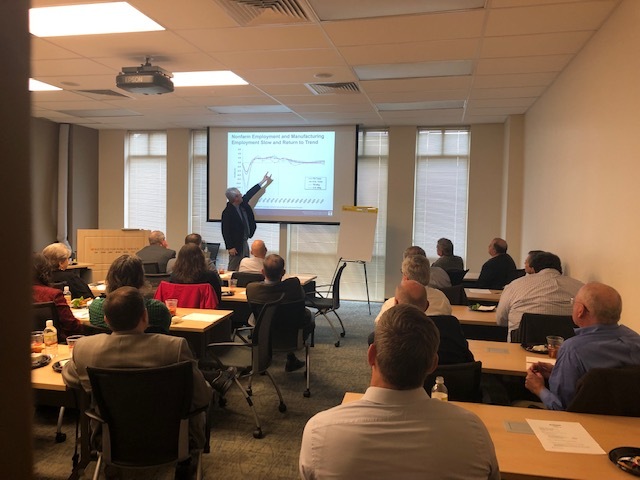 Dr. Matt Murray, associate director of the UT Boyd Center for Business and Economic Research recently spoke to the East Tennessee Industrial Council (ETIC) hosted by the Center for Industrial Services. ETIC is comprised of professionals involved in economic development in the East Tennessee region. The members of ETIC look forward to this timely meeting each year when Murray summarizes the annual Economic Report to the Governor. The discussion included an analysis of the U.S. economy as compared to Tennessee, and the much-anticipated economic outlook for Tennessee. “The economy is in good shape and continues to expand, but job gains could slow as a result of a plateau, which has occurred throughout the country,” Murray said. The Boyd Center, in cooperation with the state of Tennessee, publishes an annual report to the governor to provide the most current possible economic analysis to planners and decision makers in the public and private sectors. Click here to read the full 2019 Economic Report to the Governor of the State of Tennessee.